On Sunday 28th July 2013 Club Members with guests and welcomed newcomers gathered for casual lunch at the Eiger Swiss Restaurant at Petersham. We all enjoyed great company, exchanging information and stories about our Saints during what could be described as an eventful afternoon. All ideas for the next Club Social are welcome so please feel free to come along to a General Meeting to share them with other Club Members. 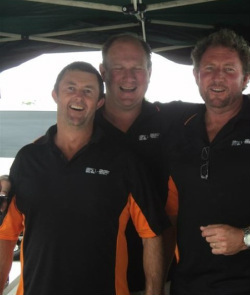 In January, March, July and October the Club held a fundraising BBQ at Bunnings Mittagong. We are very grateful for the continued support of the local community and the staff at Bunnings as we add a significant sums to our fundraising account. Thank you to the Members who support the Club on these very busy days - it is sincerely appreciated. Club Picnic For Our Saints! 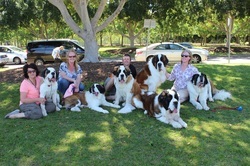 We decided to hold an impromptu picnic on Sunday 13th October 2013 for Club Members, family and friends to enjoy some time with Saints and other canine companions and to have a relaxing day at Bicentennial Park at Sydney Olympic Park, Homebush. It was a very hot day but luckily where we were it was much cooler and the Saints enjoyed a romp in the fountain and water spouts nearby. All the Saints got along beautifully, lazing around together on the cool grass and socialised wonderfully together! Sadly the hot day seemed to keep people away but we definitely will hold another picnic in 2014. 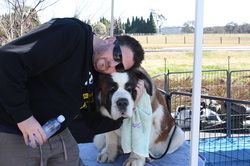 On Sunday 16th September 2012 the Club held a fundraising BBQ at Bunnings Mittagong. There was face painting and a jumping castle provided for the children. We had our Club's recently revamped breed information boards on hand. It was a busy day sharing information on Saints with the public as well as promoting Dogs NSW and Responsible Dog Ownership. The Saints received lots of cuddles and attention from everyone - the day was enjoyed by all. Other BBQs have been held on Saturday 3rd November 2012 and Saturday 12 January 2013, without our Saints which gave some of us chance to catch up with each other and relax a little. We are very grateful for the support of the local community and the staff at Bunnings as we managed to add a significant sum to our fundraising account. Thank you to the Members who supported the Club on these very busy days - it is sincerely appreciated! A Christmas In July Dinner was held at the Briars Historic Inn on Saturday 30th July 2011 at 6:00pm. Drinks were followed by a three course traditional Christmas Dinner. 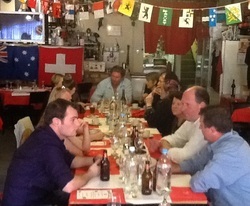 Club Members and Guests from as far as Canberra and Sydney attended the dinner on a chilly Winter's evening. A jolly time was enjoyed by all in the relaxed and cosy setting.